All treatments and fees listed below are intended to be used as a guide only. A dental implant restores missing teeth to function and appear just like natural teeth. After 12 week healing process, the implant can be used to support a dental crown. It can also be used as a support for a dental bridge or even dentures. The technology behind implants has increased dramatically over the last 10 years. Give us a call for a free dental implant consultation. 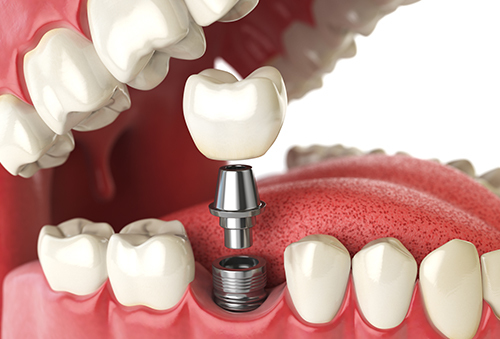 Who is a candidate for Dental Implant? If you have one or more missing teeth, or if you want to replace dental bridges, wobbling dentures, you may consider having dental implants for better esthetics, comfort, and confidence. Does it hurt to have Dental Implant? Dental Implants are placed inside the jawbone under local anesthesia, similar to the numbing sensation from getting a filling done. Additional medications are provided after implant placement to prevent infection, inflammation, and swelling for the purpose of pain control.